I was part of a powerful forum “Pensions at Risk” hosted by MP Libby Davies a couple of weeks ago. There were speakers from COSCO the Coalition of Senior Citizen Organizations, CARP, the National Union of Public Employees, journalist Bill Tieleman, and myself. The auditorium was a full, but I don’t think anyone was under 54. We were all discussing the changes proposed in the budget to change the Old Age Security and Guaranteed Income Supplement system but as we talked it became clear that this is part of a much more serious dismembering of the Canada that once made us proud to be Canadians. This is part of a political attack on Canada, the concept of universality and our wonderful social programs: pensions, education, health care, welfare and housing which have been available to everyone from coast to coast to coast. These proposals are made in the interests of the corporations who can create private for profit systems such as they are doing with health care and education and make money from what the public has paid for with our taxes. These changes are a serious attack on democracy and the social programs that have made Canada a great nation. The Harper government is tearing Canada apart by stealth, attack ads, negative campaigning, lies and election fraud including robo-calls. The recently announced changes to OAS Old Age Security and to GIS Guaranteed Income Supplement are completely fiscally unnecessary, says the Parliamentary Budget Officer Kevin Page. The Conservatives did not campaign on making any changes to the pension system. The public was not consulted during the election campaign. The public does not agree and does not support the changes as shown by a February Ipsos Reid poll. Seventy per cent of Canadians polled disagreed that “social programs, seniors pensions, and other benefits in Canada are more generous than we can afford to pay for” and 70 per cent also disagreed with the statement that “we need to keep taxes down, even if it means we have to sacrifice in terms of seniors pensions and other social benefits”. 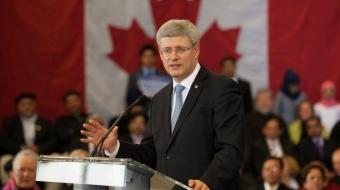 It is a political choice by Harper and the Conservatives not an economic choice. They are willing to spend billions of our hard earned tax payer’s money on jails which costs taxpayers $88,000 per prisoner annually in the short term. Prison costs will be rising to $4.4 Billion to $9.5 billion in the long term. They are spending over $20 billion per year on defense, plus the $29.3 billion on the fighter jets and over $60 billion on navy frigates and other boats. They have cut $23 billion in taxes to the corporations and are providing $1.4 - $2 billion per year in subsidies to the oil and gas companies. Canada spends less on pensions than the US and most EU countries, far less than the average 7 per cent of nations in the OECD. She is very clear that we can afford the OAS and GIS. If there was a concern about baby boomers spending all the money, then why implement a change that doesn’t affect them but will affect their children who are facing a decline in employer pension coverage, heavy debt loads and an impossible housing market?